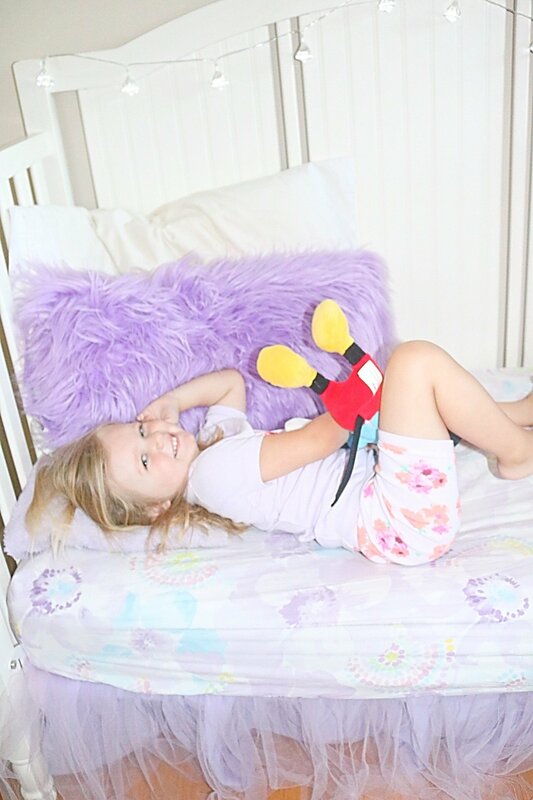 Now that it’s officially Summer (Yaaaay), the days are longer, there are a ton of activities, picnics, and barbecues so it’s easy to slip into bad habits around bedtime. 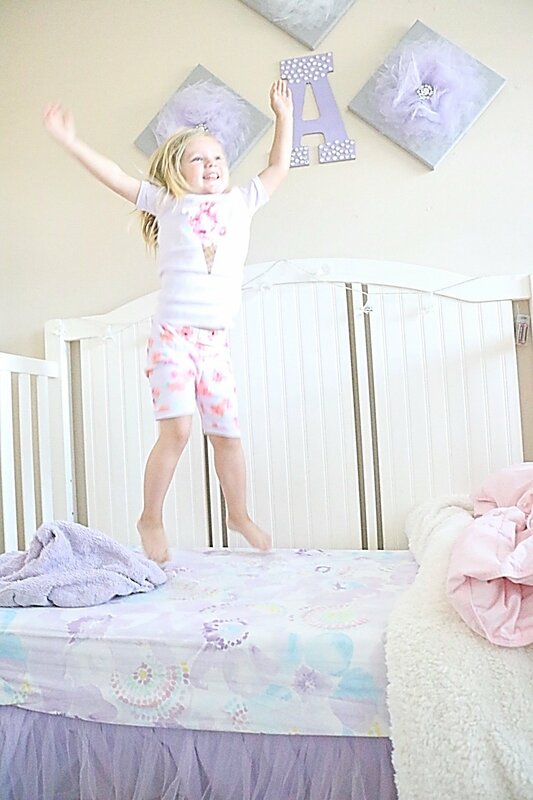 But, I think it’s important to help your children maintain a good bedtime routine to help keep them healthy, make the most of their summer and make that transition back to school a little bit easier. Kids actually need a lot of sleep. I mean who wants an overtired child? They’re not only tired, but they get all cranky, on edge and their immune systems get weaker…And I’m not about sick, edgy kids if I can help it. So getting your kids the right amount of sleep can actually help prevent some of this. After dinner the girls either take a bath or we do a quick wipe down: cleaning hands, feet, face and bottoms. I don’t know about you, but I’ve experimented a bit with bed times to see if it makes a difference in their sleep. I have found no matter what time they go to bed, they wake up at the same time. So sticking to the routine helps optimize their chances of getting 10-12 hours of sleep. Find a scent they can associate. With all of the essential oils and scents for sleep out there I say pick your favorite. We use the Johnson & Johnson Bedtime body wash and lotion (see my post here). I still use it to this day, even if it’s just a small amount on their neck/chest/arms because they have grown to associate the smell with nighttime and sleep. Set up a tranquil environment. We have utilized a sound machine since Aria was two weeks old and Amelia since she first came home from the hospital. The minute we walk into their room for bed, it gets turned on. I know Amelia sometimes has a harder time winding down than Aria, but as soon as we go into her room, give her her blankie and turn on the sound machine her head immediately lays on down and she starts trying to fall asleep. Allow for an item of comfort. Both of my girls love their blankies, but this could easily be a stuffed animal, doll or lovie. Again it’s one more item that helps associate bedtime and going to sleep. Get the right bedding and mattress. Kids get hot while sleeping. The type of bedding used can affect the body’s temperature; linen is one of the best to use for summer. 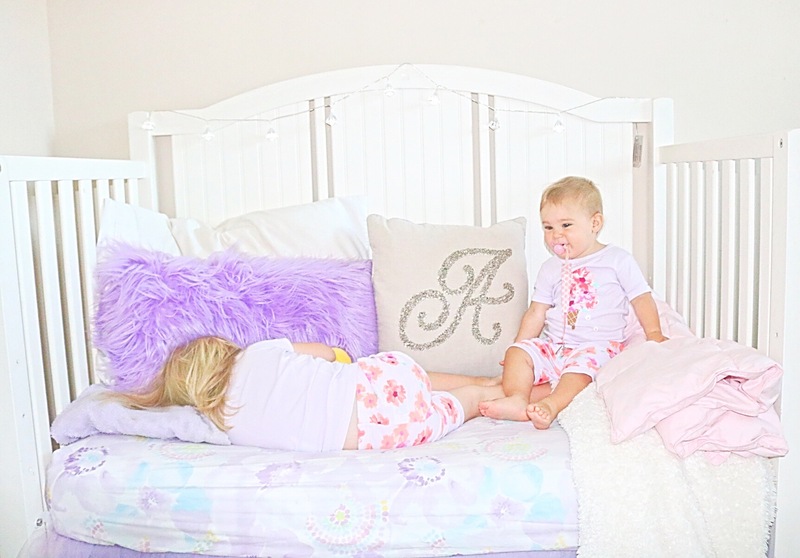 There are also a variety of pillows and mattresses that can affect their little bodies. Mattress Firm is actually a great place to check out for a variety of these and you’ll be able to try them out. In fact, I just got a new memory foam pillow from there. Thanks to the friendly staff for helping me choose the right one because I haven’t slept better and not waking up with as many headaches and sore neck/shoulders. Always stick to the routine. I know this sounds hard to do because you may be traveling or up late with guests over. But trust me, when it’s getting late and they’re having that overtired fit about not wanting to go bed, you’ll find they get into it and settle down quickly because it’s what they’re used to. One thing we do if it’s getting late is just shorten the routine by cutting the wind down time (songs/books/shows) in half, and it still works! Check out your local Mattress Firm to test out and find the right products for you and your family. I’ve attached a coupon at the bottom of the post + there’s a HUGE 4th of July sale going on right now!! So be sure to check it out and update everyone’s mattress, pillows and bedding. Kallie, such a beautiful post in both your writing and the pictures you shared! I can see this as being so useful for newer moms who maybe don’t quite have their foothold just yet. Your tips are so useful! 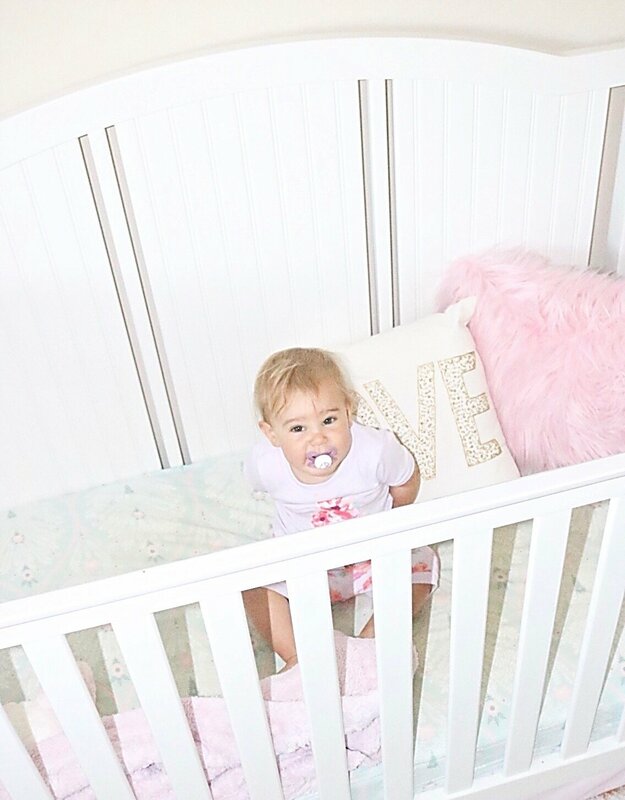 I can definitely see and agree with you on how sleep is so important for children, and it’s important to keep up that routine in the summer months! Kallie, loved your post!! Its beautiful! I don’t have kids yet but I will definitely use your advice when the time comes. Thank you! You’re so sweet and thank you for stopping by! Oh man hardly any darkness!!! That’s got to be so hard!! Such a cute post! Love the smiles too and your babes are so delicious! Thank you for the tips!!! Oh my goodness, that second pic had me cracking up, so cute! I don’t have kids yet, but have two friends with little ones on the way, I’ll be sure to share this with them! Thank you! You’re so sweet and appreciate you stopping by! Hello dear first off. Thank you for this post. This is a beautiful post and the shots are so cute. I’m an uncle that takes care of 2 boys during the week and these tips were honestly so helpful. I wish I read this post earlier today. Thank you for this post. I really loved it. Oh thank you Dom! I’m so glad you found it helpful! Good luck with getting those kids to bed! This is so beautiful in both your gorgeous captures of your amazing family and the extremely well thought out and wise advice. My husband and I were always firm believers in routine even though our kids are big now , 11&7, and we are school teachers so home for the summer. 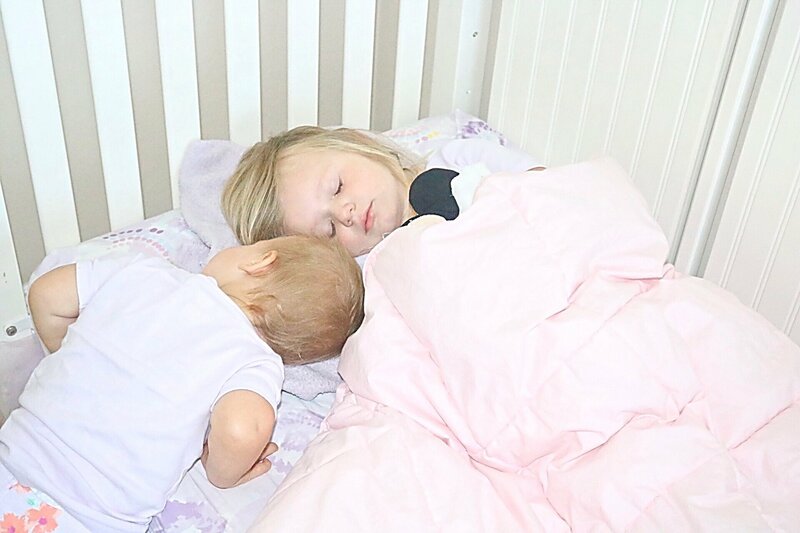 I still really make sure that no matter what the kids get a good night sleep and I will definitely try your tips ! !